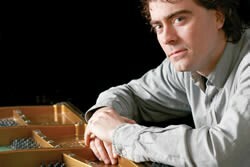 Paul Lewis, a graduate of Chethamís and the Guildhall School, and a student of Alfred Brendel, is recognised worldwide as his teacherís heir in the music of the Classical period, Haydn to Schubert. Without question he is Britainís most sought-after young pianist, bringing an audaciously fresh approach to everything he plays. He is currently recording the complete cycle of 32 Beethoven sonatas and this programme combines less familiar sonatas with the much-loved ëMoonlightí, its magical opening slow movement never failing to mesmerise.